This article updates the farmdoc daily article of November 30, 2018 by examining the dairy policy provisions in the recently passed Agricultural Improvement Act of 2018. It renames the current Margin Protection Program for Dairy Producers (MPP-Dairy) the Dairy Margin Coverage Program (DMC). 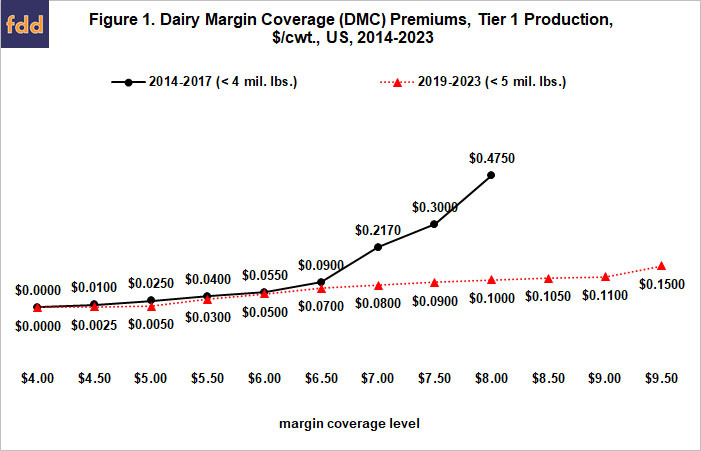 DMC, which is authorized from January 1, 2019 through December 31, 2023, has enhanced coverage and lower premiums relative to the current MPP-Dairy program. DMC Coverage Levels and Premium Rates: Premiums and coverage levels are presented in Figures 1 and 2 for the 2014-2017 period of the 2014 farm bill vs. the 2019-2023 period of the 2018 farm bill. This comparison argues that, for dairy commodity support policy, the Bipartisan Budget Act of 2018 and Agricultural Improvement Act of 2018 should be treated as the 2018 farm bill. Taken together the two bills expand the covered milk production history that qualifies for Tier I protection by 25% (5 vs. 4 million pounds), substantially reduce Tier I premiums (for example, by 79% at the $8.00/cwt. coverage margin), adds higher Tier I coverage margins ($8.50, $9.00, and $9.50 per cwt. ), and expands the share of production history a dairy can elect to cover from 25%-90% to 5%-95%, with both ranges at 5% increments. By allowing coverage down to 5%, herds with production up to 100 million pounds (approximately 4,000 average milk cows) can limit covered milk production to Tier I. 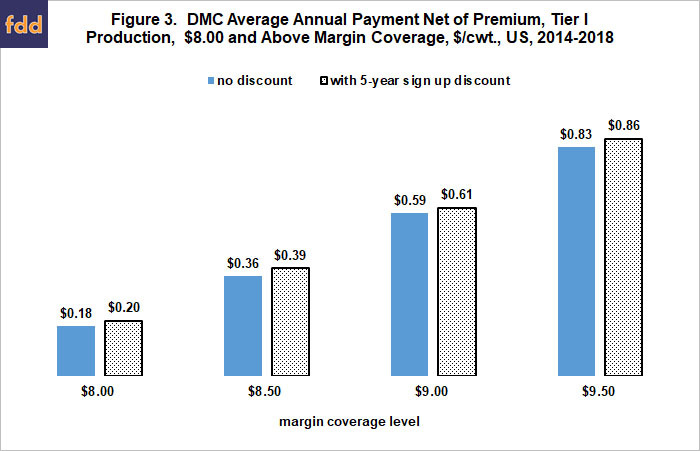 In contrast, Tier II premiums are raised at coverage margins above $5.50/cwt. (for example, by 34% at the $8.00/cwt. margin). Covered production history is the largest production in 2011, 2012 or 2013. 5-Year Sign-Up Discount: Any dairy that signs up in 2019 and commits to keep its coverage decisions for the life of the 2018 farm bill will receive a 25% discount on their annual premium. Multi-Producer Dairies: A multi-producer dairy is treated as a single operation under DMC. However, not every owner has to sign up for DMC. Total premium due and total payment will be adjusted downward to reflect the proportion of ownership participating in DMC. New Dairies: Dairies started after January 1, 2014 are provided an option to establish a DMC production history. DMC payment is prohibited to a dairy the Secretary of Agriculture, hereafter Secretary, determines reorganized its operation solely to qualify as a new DMC operation. Feed Cost Review: The Secretary is required to submit reports to the relevant congressional committees that (1) evaluate the representativeness of data used to calculate DMC feed cost per cwt. of milk and that (2) detail costs incurred by dairies that use corn silage and compares this cost with the feed cost of corn. The Secretary must also revise monthly surveys to report prices for high-quality alfalfa hay in the 5 top milk producing states measured by volume. DMC and Livestock Gross Margin for Dairy Program (LGM): Dairies are permitted to participate in both DMC and LGM on the same production. Moreover, dairies locked out of the revised 2018 MPP-dairy program due to LGM participation are allowed to retroactively participate in MPP-dairy for the months in 2018 they were excluded from participation. 2014-2017 Premium Repayment: The Secretary is required to repay each dairy that participated in MPP-dairy during calendar years 2014-2017 part of the difference between total MPP-dairy premiums and payments. Repayment equals (1) 75% of the difference if repayment is taken as credit toward DMC premiums or (2) 50% of the difference if repayment is taken as cash. If ownership and production history of a dairy has been sold or transferred, the current owner receives the refund. Owners of a dairy that ceased operation or been dissolved will receive a refund based on their ownership share. An application is required for repayment to occur. Federal Milk Marketing Orders: Class I price mover is defined as the average of Class III and Class IV price plus $0.74/cwt. Current Class I mover is the higher of Class III or Class IV price. Milk Donation Program: The current Dairy Product Donation Program is repealed; a new Milk Donation Program is authorized. Objective is to make it easier for dairy producers, processors, and cooperatives to donate fluid milk to public or private nonprofit organizations that provide food assistance to low income groups. Mandatory funds of $9 million in fiscal 2019 and $5 million each succeeding fiscal year are provided to reimburse eligible costs by “accounting to the Federal Milk Marketing Order pool at the difference in the Class I milk value and the lowest classified price for the applicable month (either Class III milk or Class IV milk).” Preference is to be given to donner-distributor partnerships that provide funding and in-kind contributions. Resale of donated products is prohibited, and audits are required. Historic DMC Payments: It is always tenuous to project future payments by a program from history. Payments may alter supply response, particularly if payments are large enough to keep financially-stressed farms from exiting. Nevertheless, history is a useful and reasonable starting point for understanding potential payments. Tier II protection has a premium near $2/cwt. for its highest available margin ($8.00/cwt. ), making it an undesirable option in most years. Thus, Tier I protection is our focus. Consistent with the November 30, 2018 farmdoc daily article, the historical period used to estimate payment is the recent period from January 2014 through October 2018, the latest available month. To simplify and focus the presentation, only coverage margins of $8.00/cwt. and above are discussed as they are likely to be the most attractive coverage levels for participating farms. Average annual net payment over the 2014-2018 period ranges from $0.18/cwt. to $0.83/cwt. at the $8.00/cwt. and $9.50/cwt. margins, respectively; assuming no 5-year sign-up discount (see Figure 3). The 5-year discount adds an extra $0.02-$0.03/cwt. at each coverage margin. The obvious implication is that adding coverage margins above $8/cwt. is a major change in dairy policy. For 2014-2018, having the highest margin coverage level at $9.50/cwt instead of the current $8.00/cwt. would have increased per cwt. average annual Tier I protection payments by 330% or $0.66/cwt. ($0.86-$0.20). One Perspective of DMC Impact on Dairy Farm Profits: Financial stress of dairy farms has attracted considerable attention the past year. To provide one perspective on how DMC may impact dairy profitability, Table 1 presents average annual 2014-2018 payment at the $9.50 margin by dairy farm size relative to milk production profit and loss as reported by USDA, ERS (U.S. Department of Agriculture, Economic Research Service). Economies of size is a key feature of the US dairy sector (see Zulauf, May 25, 2017 and August 17, 2017 farmdoc daily). Dairy cost of production data are available for 2014-2017 but not for 2018. Thus, the two variables cover different periods. While this difference must be kept in mind, the comparison is reasonable and involves the latest available data. The average payment data used in Table 1 does not consider the 5-year sign up discount. The estimated average payment of $0.83/cwt. (see Figure 3) is reduced for the smallest herds by 5% to $0.79/cwt to account for 95% being the highest amount of production history DMC can cover. We assume that larger dairies can exactly adjust the coverage margin so they exactly cover the 5 million pound cap on Tier I protection. Impact is measured as both $/cwt. and percent of profit or loss (see Data Note). The $/cwt. impact is greatest for the smallest dairy farms as annual production is less than the 5 million pound limit for Tier I protection. $/cwt. impact declines as milk production increases above 5 million pounds. Measured as percent change in profit or loss, impact is greatest for 200-499 cow herds. While a loss still occurs, it declines by 41%. DMC 2014-2018 payments did not result in any farm size turning a loss into a profit. DMC is estimated to increase per cwt. profit on 500-999 and 1000 or more cow dairies by 18% and 3%, respectively. It is worth noting that considerable controversy surrounds measurement of cost on dairy farms, especially on small dairies. Thus, these findings may be dependent on using the USDA, ERS data set to measure cost and thus profit and loss. Changes enacted in the Bipartisan Budget Act of February 2018 and Agricultural Improvement Act of 2018 (hereafter referred to as 2018 dairy policy changes) confirm a strong commitment to dairy policy based on the margin between milk prices and feed costs, not the price of milk and milk products as characterized dairy support policy prior to the 2014 farm bill. The 2018 dairy policy changes are clearly designed to increase payments to dairy farms, likely driven by concerns over financial stress in the US dairy sector. When measured by $/cwt., the 2018 dairy policy changes most benefit small dairy farms. When measured by percent change in profit or loss, mid-size dairies appear to benefit most. The analysis presented in this article suggests that the 2018 dairy policy changes do not appear to alter the economies of size forces at work pressing dairy farms to get larger or differentiate out of commodity milk production. For example, no farm size has 2014-2017 losses turned into profits. The 2018 dairy policy changes do, however, raise a policy issue of potentially great importance: “Is DMC providing so much support that it increases the economic incentive to produce milk and/or reduce the willingness of financially stressed dairy farms to leave the sector?” To the extent the future reveals a “yes” answer, more milk production means lower milk prices and thus higher cost of the DMC program to the Federal government. Emergence of this outcome could mean that, in its desire to help financially struggling dairy farmers, Congress has created a DMC program that may cost so much that political friction for change emerges. In the past, this type of fraction in dairy policy has often resulted in various programs to buy out dairy herds. 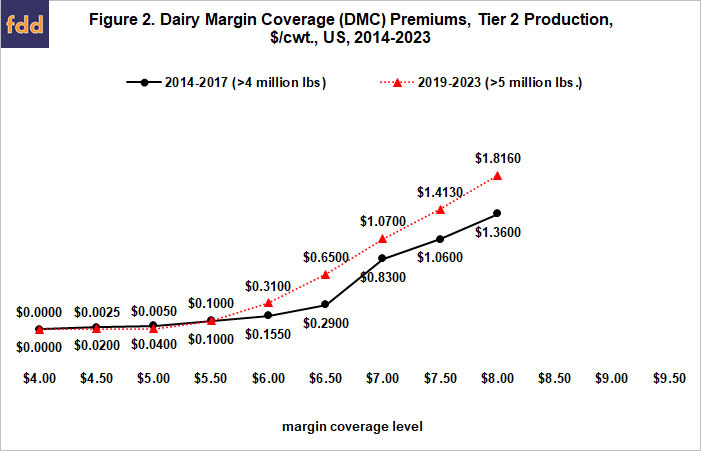 In short, whatever the future holds, DMC will likely be watched closely by both supporters and detractors, both within and outside the US dairy sector. Base year used to calculate cost of producing milk was changed from 2010 to 2016 with the 2016 report. At the same time USDA, ERS split the 1000-or-more-cow category into 1000-1999 cows and 2000 or more cows. To maintain consistency, return above total cost was calculated for a 1000 or more cow category. Net return reported for the 2 new categories was weighted by their respective share of average annual milk production per farm calculated using average number of cows and production/cow as reported in the cost of production data for the 2 categories. Net DMC payment per cwt. for a size category was determined using average milk production in the 2010 base year for a category (average number of cows times average output/cow). The 2010 values were 507,045 pounds (lbs. )/year for fewer than 50 cows, 1,165,316 lbs./year for 50-99 cows, 2,555,145 lbs./year for 100-199 cows, 6,190,704 lbs./year for 200-499 cows, 15,760,142 lbs./year for 500-999 cows, and 52,016,160 lbs./year for 1,000 or more cows. The 2016 production values were used to calculate DMC payments per cwt. of milk produced for the categories of farm size that produced more milk than the Tier I historical production cap of 5,000,000 pounds. The 2016 production values by category were 522,206 lbs./year for fewer than 50 cows, 1,211,896 lbs./year for 50-99 cows, 2,643,976 lbs./year for 100-199 cows, 6,670,824 lbs./year for 200-499 cows, 16,230,760 lbs./year for 500-999 cows, and 69,365,869 lbs./year for 1,000 or more cows. Wolf, C. and C. Zulauf. "Dairy Margin Protection Program in the next Farm Bill." farmdoc daily (8):219, Department of Agricultural and Consumer Economics, University of Illinois at Urbana-Champaign, November 30, 2018. Zulauf, C. "Comparing Economies of Size: Milk vs. Field Crops." farmdoc daily (7):150, Department of Agricultural and Consumer Economics, University of Illinois at Urbana-Champaign, August 17, 2017. Zulauf, C. "Economies of Size in Producing Milk and U.S. Dairy Policy: A Key Relationship." farmdoc daily (7):97, Department of Agricultural and Consumer Economics, University of Illinois at Urbana-Champaign, May 25, 2017.